Five days ahead of the election, leading contenders in St. Paul mayor's race drew some distinctions between one another and addressed some of their criticisms. 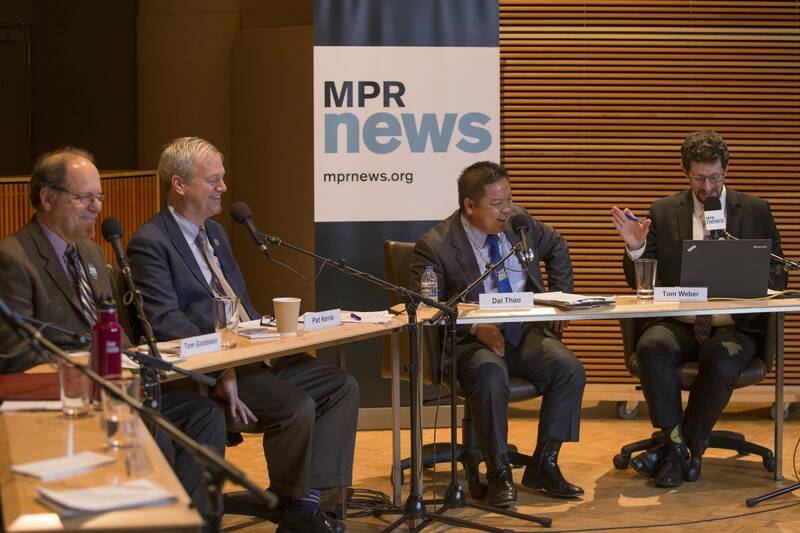 MPR News host Tom Weber led a two-hour debate on Thursday with Melvin Carter, Elizabeth Dickinson, Tom Goldstein, Pat Harris and Dai Thao. Like Monday's debate with Minneapolis' mayoral candidates, the St. Paul debate was a mostly polite affair. All candidates agreed that a controversial mailer last month questioning contender Melvin Carter's response to a gun theft in August was inappropriate and regrettable. "That incident last week was troubling, and in many ways it was even more violating than the original burglary at my home," Carter said. Rival Pat Harris, who is endorsed by the police union that sponsored the mailing, again denounced the brochure. "Voters should know that I feel the piece was appalling, I've rejected it outright," he said, while also saying he was proud to have the endorsement of the city's police force. The candidates also addressed some of their critics. Backers of City Council member Dai Thao have said that Carter's campaign was behind the bribery allegations that rocked the race earlier this year. A Minneapolis lobbyist said she'd been solicited for a campaign donation after meeting with Thao about food packaging regulations. The Bureau of Criminal Apprehension investigated and prosecutors declined to press charges. Carter, who preceded Thao on the City Council, denied that his campaign started the political mudslinging. "Our campaign has been focused early on investing in grass roots organizing, that's what gave us the success that we had at the DFL convention this past summer, and that's what's given us the momentum we have going into election day," Carter said. Thao dismissed the bribery allegations again Thursday and hit Carter for a second time, making reference to Carter's resignation from the City Council to join Gov. Mark Dayton's administration. "I have proven record that I have been fighting for everybody in this community," Thao said. "What's transactional are career politicians, who show up in our community when it's election time, whose interest is only to advance their career." DFLer Pat Harris answered critics who have compared him to Norm Coleman, suggesting Harris may effectively be the Republican in the race. Harris said he thinks the comparisons come from his experience working in finance, and said he has a "progressive" record. "Eighteen years of public financial experience, I know money. I know the city budget," he said. "And I've worked diliigently on issues in poverty, on homelessness, on housing, but I want to keep the city affordable."" The Green Party contender, Elizabeth Dickinson, conceded her lack of management and government experience, but said that might be what St. Paul needs. "I would say that my background in terms of my emotional intelligence, which is a greater predictor than intellectual, than IQ, in terms of making things work, is really important," she said. DFLer Tom Goldstein addressed his electability. He's run repeatedly for office, and while he earned a term on the school board, he lost a re-election bid. Goldstein said it wasn't about just him, but that he had a clear plan for the city. "It's a very thoughtful plan, about how we do equity. About the need for broadband, the need for job creation," he said. "I'm the only person here who has actually run a business and managed people." To hear the full debate, use the audio player above.